Two years ago, Ron Presby was diagnosed with Amyotrophic Lateral Sclerosis (ALS) and the progress of his illness has been catastrophic in that short time. 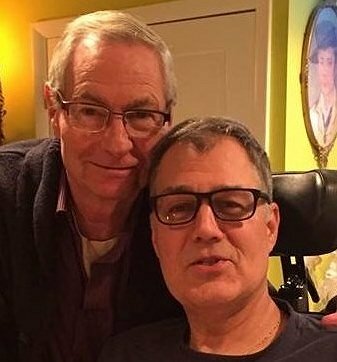 Ron now has extremely limited mobility and is dependent on the care of his husband Bob along with in-home providers to ensure his needs are met. The costs of care have greatly increased as Ron’s condition has declined, care which spans around the clock each day. Among his most critical needs is a bed that best accommodates his current condition and that can greatly enhance his quality of life. The Freedom Bed, developed by ProBed Medical Technologies, features programmable rotation which provides enhanced comfort to its users and helps to reduce long-term medical costs. It can prevent conditions ranging from pressure sores to pneumonia, both of which can prove life-threatening. The Freedom Bed is an uninsured medical expense, and its premium is considerable even in an era of very high medical costs. But it is a key instrument that will greatly enhance a critical aspect of Ron’s care. Family & friends of Ron are coming together to raise money to help toward the $40,000 expense of the bed. Ron has chosen to fundraise with Help Hope Live in part because Help Hope Live assures fiscal accountability of funds raised and tax deductibility to the full extent allowed by law for donors. Donors can be sure that funds donated will be used only to pay or reimburse medically-related expenses. To make a tax-deductible donation to this fundraising campaign, click on the Donate Now button.